Having trouble with your illumy sleep mask? Try these helpful illumy troubleshooting tips. Note that the illumy App contains a help guide for the App as well as the illumy eye mask. Click on the "?" mark icon beside the sync button to visit the App help page. If you would like to find a summary of illumy's features and learn more about the product, visit the product page here. How to adjust the sunset brightness if you find it too bright? 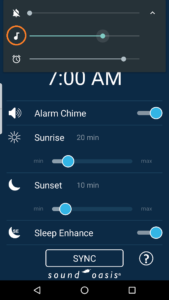 The illumy sunrise turns off 5 minutes after your chosen alarm time in order to prevent the battery from being exhausted if you forget to turn it off. 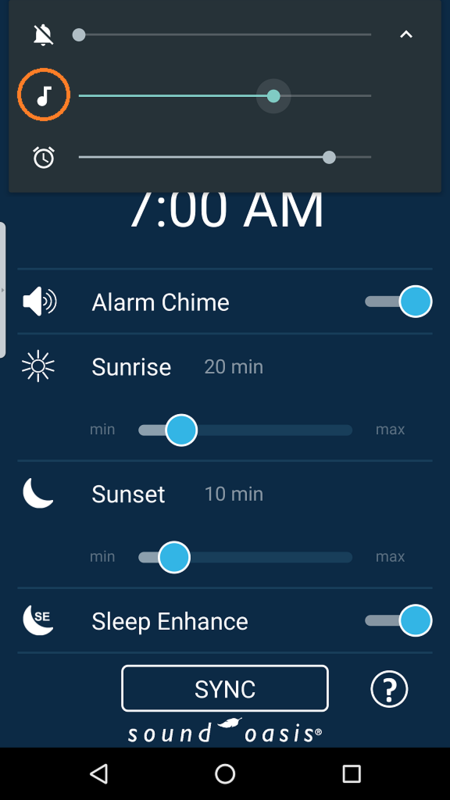 Occasionally you can sleep through the sunrise and if the alarm chime is not enabled, the sunrise lights may turn off before you wake up. 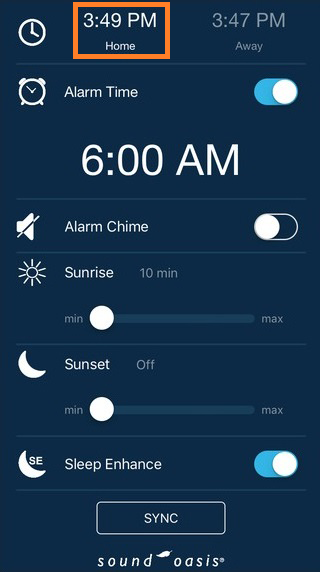 If you experience this, try enabling the alarm chime so that you have an audio queue to wake you. Don't forget to press the Sleep button when you go to bed at night. 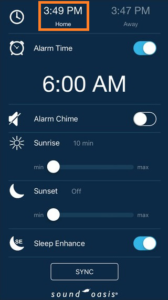 This enables the alarm for the next day. If you don't press the Sleep button at night, the alarm will not start the next morning. When syncing illumy, ensure that the clock is set to “Home” if you wish to use the current time from your smartphone. You can increase the breathability of your sleep mask by removing the thin white plastic sheet from inside the mask. This will reveal the LED panels but should not impact performance. It will allow more air to circulate in the eye pockets. 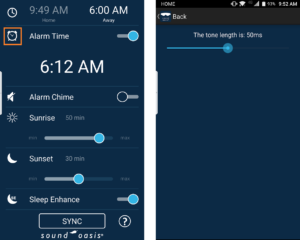 The illumy App uses sound played through the headphone jack to sync the settings with your sleep mask. This means that other Apps which make sound can interfere with the syncing process. Here are some illumy troubleshooting tips that can help ensure syncing is successful. It is important that no other Apps are playing sounds while you are trying to sync illumy. Sometimes Google Play Music or another music App will start playing on top of the illumy App. 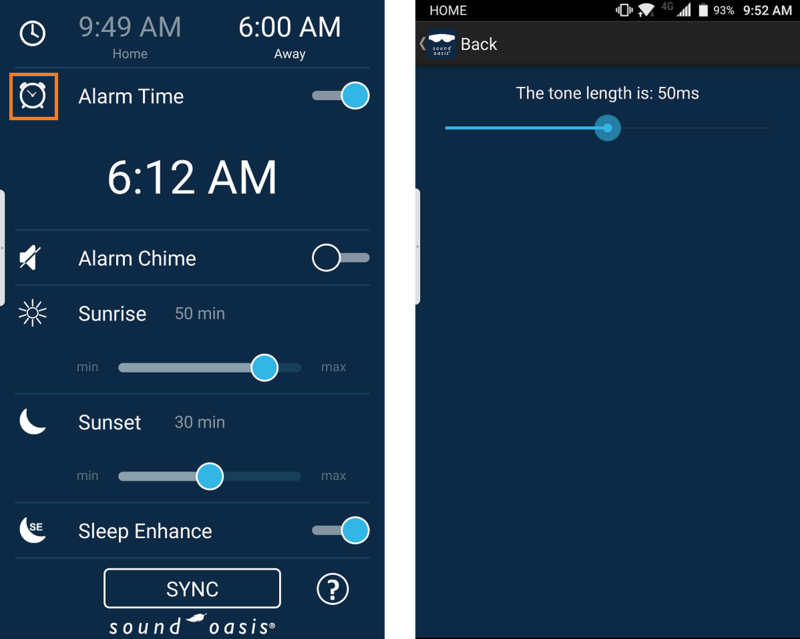 You may also try increasing the tone length by long pressing on the alarm clock icon in the illumy App and then using the slider to increase the tone length to 65 ms.